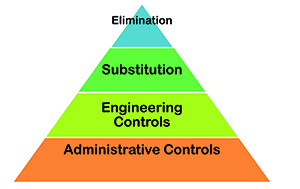 The Dust Explosion Prevention Hierarchy provides effective strategies to prevent combustible dust explosions. The strategies are listed in order of effectiveness. Avoid installation of horizontal surfaces where dust can accumulate. Eliminate "hidden" areas where dust can accumulate. Eliminate the use of compressed air for cleaning surfaces. Install smooth ceiling and wall surfaces (instead of rough finish) to minimize dust accumulation and allow effective cleaning. Install enclosed conveyance systems to replace "open" systems. Install dust collection systems at transfer points, truck receiving/loadout areas, inside bucket elevators, conveyance, etc. Locate dust collectors (baghouses) on the exterior of structures/buildings. If located inside a structure ensure dust collectors, baghouses are adequately vented and have adequate fire separation, and or explosion suppression. Always direct deflagration venting away from areas that are occupied by employees. Ensure proper electrical classifications are used when installing/retrofitting equipment (i.e. Class II). Install hazard monitoring (motion detection, belt alignment, bearing temperature monitoring) on bucket elevator legs and conveyance. Install deflagration suppression systems on bucket elevator legs. Install deflagration suppression systems on interior dust collection (i.e. baghouses). Install oil-addition systems (food grade) to reduce dust levels. Pressurize interior areas to reduce fugitive dust. Prevent tramp metal from entering the product stream by using magnets and properly sized grating at receiving areas. Install magnets to remove metal from the process flow. Develop and implement a combustible dust inspection program to identify housekeeping opportunities. Develop and implement a written housekeeping program that defines the responsibility, frequency, and acceptable methods for cleaning. Develop, implement, and enforce a hot work program. Develop, implement, and enforce the "No Smoking" policy. Educate employees, contractors, visitors, and drivers on the hazards of combustible dusts including common ignition sources such as smoking. Implement cleaning techniques that minimize placing dust in suspension. If using compressed air for cleaning, implement a permit system that requires the elimination of ignition sources during cleaning activities. Develop and implement a documented preventive maintenance program that defines the types of equipment inspected (bucket elevator leg, drying equipment, conveyance, dust collection, etc.) frequency of inspection, inspection elements, etc. Develop and implement a routine inspection program to identify point sources of fugitive dust to include bucket elevators, distributors, conveyance enclosures, dust collection equipment, spouting, etc. Develop and implement a program for inspecting and cleaning magnets.